Your fine dining experience begins right here. We pride ourselves on our quality of service and quality of our food. We go the extra mile by bringing only the best quality spices direct from the Indian subcontinent which we use to skilfully flavour our cuisine. We are offering an exclusive and atmospheric dining in experience, throwing out a warm welcome for those who savour real Indian food and cuisine. 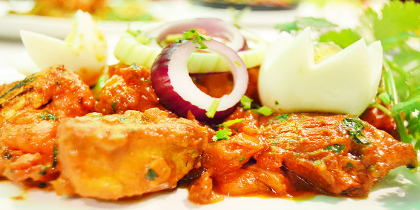 Razbari offers the varied and delicious tastes of India gleaned from traditional homes all over the sub-continent, something which sets it apart from the local curry houses. Wonderful food is served up in an informal friendly environment where staff will make a sincere effort to provide diners with a warm and courteous service.